Afghan women are rocking the boat for their social and financial freedoms, and their opponents wouldn’t even know it, thanks to an organisation that pays them to exercise those rights – in bitcoin. Women’s Annex Foundation (WAF) encourages girls to think independently and discerningly through blog writing, software development, video production and social media. It gives them a platform to send their ideas into the world that both pays for them in bitcoin and provides free Web access in a safe place. The social and economic barriers that women in developing countries face everyday are disheartening. Even though women’s rights in Afghanistan have taken many positive steps forward since the end of Taliban rule in 2001, they remain at astounding odds with the standard found elsewhere in the world. Afghanistan’s patriarchal society deplores the autonomy of women. Families commonly object to their girls’ employment, education or any pursuit that could make their control over themselves and their interests louder. Although the statistics for female education have improved greatly over the last decade, families often make their girls leave school in their early or pre-teen years. And while it’s considered unacceptable for girls to be taught by men without the presence of women, there’s a lack of female teachers. It’s at this juncture of social and economic inequality that WAF stands to make an impact. Co-founders Forough and Roya Mahboob hope that by earning a salary independently, the girls’ families might see their education as a source of income and become more supportive of it. It’s not always so straightforward, though. It’s common for families to confiscate money earned outside the home as an act of disapproval, for family use or other reasons out of the girls’ control. At least 2,000 WAF users in Afghanistan are paid in bitcoin. Their average income falls between $250 and $400 monthly. The country’s average annual income is US$680, according to 2012 data. Payouts to the girls in Afghanistan were problematic before bitcoin was integrated this February. It compensated users in US dollars via bank wires that required hefty fees or PayPal, which isn’t supported there. They would send the money to Mahboob in one lump sum, Forough recounted, who would then cash it and find a place to pay all her users in a given locaton. With bitcoin, no one other than the payee has to know that she has a bitcoin wallet. WAF can pay the girls in a timely manner with minuscule fees. This eliminates the need to open a bank account, which would require extensive documentation and the need for legal guardian approval if they are underage, which could result in more difficulties. Although, it seems other people could argue that for a long time. Usability is something WAF is working on in Afghanistan, Forough said. Film Annex, the group’s parent company, provides a marketplace for content contributors to spend the bitcoins they earn, currently offering mobile and Skype credit. It offers Amazon gift cards to users in some regions, but since the concept of billing or shipping addresses doesn’t exist in Afghanistan – requiring any packages to be delivered to organisations or offices working with FedEx – users there can’t spend their digital currency earnings as easily. Currently, WAF is scouting around for local shops in Afghanistan to collaborate with on bitcoin acceptance, particularly electronics stores, to give its girls easier access to their own smart phones and tablets – thereby encouraging further engagement with both social media and bitcoin. Developing countries lack the infrastructure needed to participate in and benefit from bitcoin. A 2011 Gallup study said that 3% of the Afghan population have home internet access. It can cost around US$1 an hour to use an internet café in Afghanistan, she explained, a high price for many. Girls often have to find an all-women’s center, both to avoid verbal harassment from men and to steer clear of issues arising from disapproving family members. WAF also provides female teachers and a curriculum teaching them everything from the fundamentals of how to operate a computer to how to use sites like Twitter, Tumblr, LinkedIn, Facebook and the Women’s Annex platform. The schoolgirls that attend are between 13 and 19 years old. At the same time, bitcoin also grants independence and self-responsibility to anyone that embraces it. In February PricewaterhouseCoopers reported that 96% of people surveyed that partake in bitcoin discussion are men. Given the reach of its different functions, it takes a certain curiosity and tenacity for one to educate him- or herself about it – about its role as a digital currency, as a store of value, as an underlying technology; its regulatory grey area and its philanthropic application. And perhaps all that responsibility and self-reliance is the very thing keeping mainstream consumers from embracing it and consequently holding back more organisations from integrating bitcoin in other fields. WAF’s more active users generate more income. They receive a BuzzScore, an algorithm exclusive to the networks of Film Annex. It calculates users’ social media activity to rank their online influence, with factors including the frequency of content production and social sharing, subscriber numbers and growth rates, and the collective weight of both a user’s BuzzScore and those of her subscribers. As her BuzzScore increases, so do her earnings. The organisation has around 60,000 registered users worldwide – 6,000 of which are in Afghanistan. The platform supports content not averse to any religion or political view, with moderators serving users who speak the English, Dari and Pashta, Urdu, Arabic, Chinese and Italian languages, among others. This seems to suggest and exemplify WAF’s motto: “No politics, just Internet”. WAF is a nonprofit organisation that took off in 2012. Outside of Afghanistan, it operates in Pakistan, Egypt and Mexico. 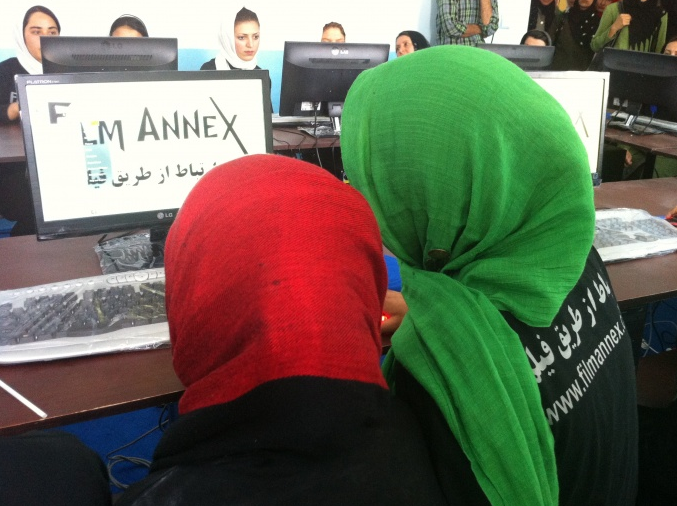 In addition to the computer labs that have been established in Herat and Kabul schools, it’s also built two independent computer labs in the respective areas. The organisation is mostly driven by donations, but is also backed by Film Annex, who contributed greatly to the creation of the computer labs. The eleventh school is partially funded by Craig Newmark of Craigslist. WAF aims to raise $300,000 by the end of 2014.